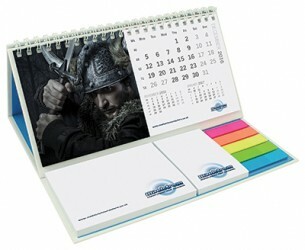 Give your customers a treat with the personalised Calendarpod - Wiro. This useful little item contains a month-to-view calendar, A7 sticky note pad with 50 sheets, A8 sticky note pad with 50 sheets, and five multicoloured index tabs containing 25 sticky notes in each. It stands on its own on a flat surface, and it also has a spiral edge to easily turn the pages. This item is printed with your branding using litho or digital printing.